Home › Organics › Organic potato starch – is there enough and where does it come from? In a growing market like organic food – which is transforming itself from a very small niche into a part of the mainstream – supply issues are a little different. The organic market has grown 10% year-on-year for several decades now and the main food trends seem to support the idea that this will continue. In some leading countries organic has already exceeded 10% share of the food market. Typically the local production of organic raw-material is not increasing at the same pace so raw-material is often imported. Managing the supply chain and ensuring raw-material availability is a key to success in the organic food business. In order to understand availability of organic potato starch it is important to understand that specific supply chain. Some points that are self-evident to those in the industry need to be explained as a background. Globally most potato starch is produced in Europe and the same is true for organic potato starch. The raw-material – starch potatoes – are somewhat different from normal table potatoes in that their starch content is very high (often over 20% – so double that of table potatoes). Therefore it is a speciality crop which is always contracted with farmers. Starch potatoes can not be bought on the open market. Also they must be cultivated relatively close to the factory to avoid high logistic costs. After all potatoes are mostly water. Importing potatoes is really not an option. The bottom line is that annual volume depends totally on what raw-material was produced by the local contract farmers. And that depends on how much was contracted and the weather conditions. With extreme weather conditions we have seen in recent years yield levels can vary quite substantially. On the other hand we are systematically increasing the contracted production acreage in order to be able to answer to the growing demand. But you can grow only so fast: you need to recruit new farmers, do knowledge transfer and grow organic seed potatoes of the best varieties. Once farmers are onboard they generally stay. Growing and buying organic starch potatoes is a long-term commitment. Farmers are given fixed prices for several years so they can safely plan ahead. 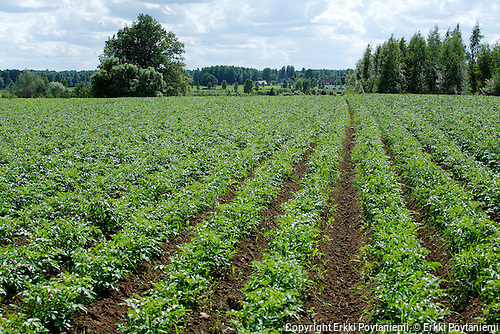 Organic starch potato field in Latvia. An other point to understand is that potato starch is produced as a campaign, which means that starch production starts in September with harvest and goes on as long as the potatoes are harvested or it becomes too cold to run the factory – normally until November. After the campaign the factory knows what it haves and it can not be changed before the next harvest a year later. The logic behind this is that potatoes are difficult to store while potato starch can be stored for years without any problem (the official shelf life is 48 months but in reality it could be much more). Organic potato starch is dried on a rotating vacuum drum. While there always is a risk of crop failure in agricultural products, our strength is that we produce organic potato starch in three factories in three countries around the Baltic Sea. 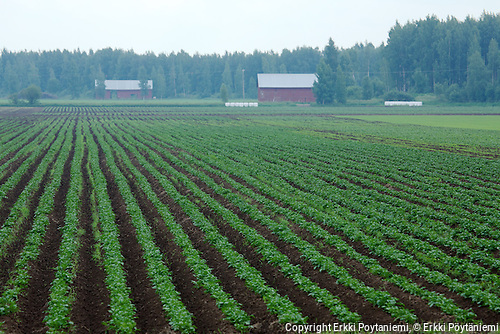 Currently the biggest production is in Latvia with Finland following and now we also produce in southern part of Sweden. Latvia is a relatively small country so organic starch potatoes can be contracted in neighbouring Estonia and Lithuania as well. So the different production areas balance each other out and importantly the production is growing in all countries. All the mentioned countries have exceptionally high share of organic farming so there is plenty of room to produce. All the potatoes are produced within the European Union. Organic potato starch from the three shores of the Baltic Sea. 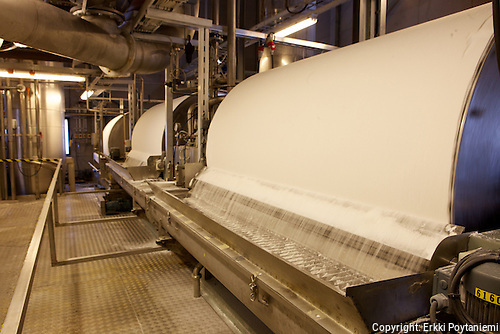 Finnamyl started organic potato starch production in Finland in 2000 but initially volumes were small. Aloja Starkelsen started in Latvia in 2009. Since 2011 the two companies have collaborated under organicpotatostarch.com and increased jointly the production year by year. However in 2016-17 – despite increasing acreages – there was practically no increase in volumes due to bad crops. As our main competition had similar problems this led to availability problems which are alleviating only now after the 2018 campaign. All in all the production volume of organic potato starch in the organicpotatostarch.com collaboration has grown five-fold from 2011 to 2018. In 2019 acreage is again increasing. Anyone following the conventional starch market will know that 2018 was extremely difficult for potato starch due to the severe draught in Northern and Central Europe. Volumes are down and availability is a real issue. Likewise prices are up. So expectations were that this might be a third bad year for organic potato starch in a row. Coming into the 2018 campaign we again had no carry-over stock so it would have been a nasty situation. But this time the organic potatoes had a nice surprise in stock for us. Test diggings in August and September showed that the yields could be normal or better than normal. How could that be in such a dry year? Organic potatoes reacted to the draught differently than their conventional counterparts. There are two main reasons. Soils on organic farms are in better condition which affects directly the soil’s water holding capacity and in general sensitiveness to adverse conditions. This is due to crop rotations including clovers, organic fertilisers and better microbiology in the soils. The other factor was less disease in dry conditions. Normally the growth of organic potatoes ends – sooner or later – with late blight (Phytophtora). In the dry summer of 2018 late blight never arrived and the potatoes just went on growing. All in all we had a very good harvest in Finland and a normal harvest in Latvia. After 2 years of struggling with availability the volumes are again there. When we started to systematically develop the market under organicpotatostarch.com our colleagues in Austria were producing far larger volumes then we were. Now we might be in par. There are some smaller producers and some volumes apparently coming in from China. The main point for end users is that there is at least 2 big producers and volumes are available. While there are inevitably risks in weather and farming we think it is safe to say that the availability problems are now over. After two years of no carry-over stock we plan to keep carry-over for 2019 in case there is a bad year again. That is a lesson we have learnt. The total availability in 2019 will in any case be bigger than 2018 so we are here to give the market a signal to develop and expand. Nevertheless it is always good to get in touch well in advance of needing those few hundred tons. Volumes that are peanuts in the conventional market can still be an issue in the organic market. Organic food already has an average market share of 4 to 5% in high income countries in Europe and North America and growing. Other markets in Asia and elsewhere are following. China is already one of the biggest markets for organic food. However the marketshare of organic starches is lagging far behind that kind of numbers. Organic consumption always starts with basic food stuffs: fruit and veg, dairy, grain and bakery products etc. Processed food where starches are typically used for functionality come far behind. But we believe that when markets pass the 5% mark the share and range of organic processed foods grow substantially. And because chemically modified starches and many additives cannot be used (they are not allowed in organic food) functional ingredients like potato starch become of high value. And by the way – we know something about that.